*This post may contain affiliate shopping links for your convenience. My first five years of teaching were spent in kindergarten. I taught half day and was in super survival mode. I can't even remember if I had classroom jobs...😉 Somehow we made it through though! The first type of job I tried was just one boy and one girl. They would be the helper for the day. I found this didn't work for me because I didn't have specific tasks for them. I ended up doing everything and then remembered afterwards that they could help me. From two very broad jobs I went into very specific jobs including one for each student. 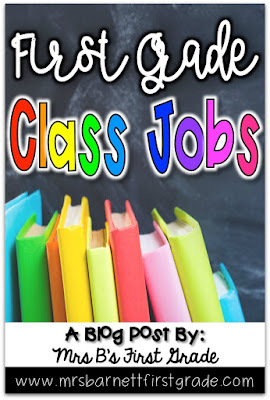 I got desperate to think of jobs - who wants to be the garbage collector?! - and found that some jobs had a lot to do and other jobs has basically nothing. This worked for me for years. I rotated the jobs every two weeks. Kids were happy with jobs like line leader and teacher helper. Not so happy with jobs like electrician and locker checker. I decided it was time for a change. An in-between of my two attempts at classroom jobs. Morning Folders - I have someone collect our homework folders when kids take them out of their backpacks in the morning. 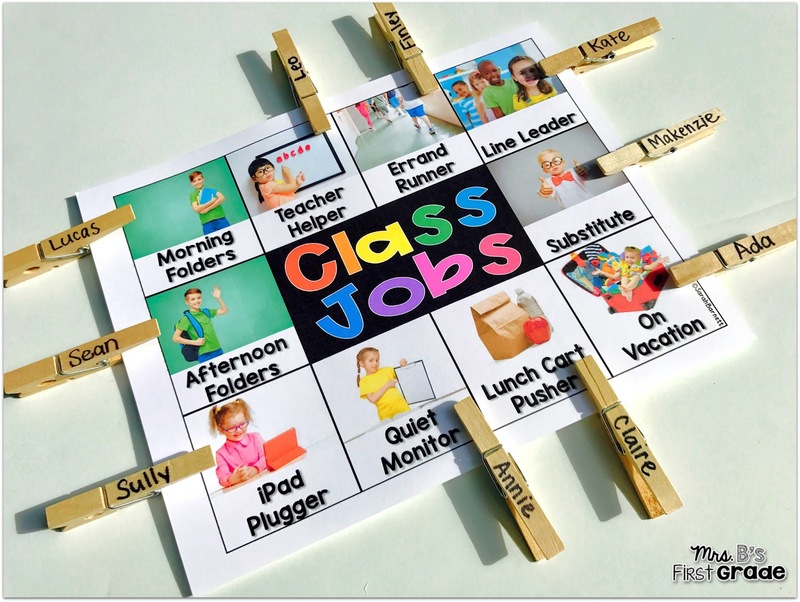 Teacher Helper - Basically the job that encompasses all jobs! Could be anything from turning on lights, to filling out our calendar. Errand Runner - Runs errands for me in the school. Line Leader - Leads our line whenever we walk in the hallways. Substitute - Takes over for kids that are absent. Lunch Cart Pusher - We put our lunches in a cart. This person pushes it down and sets the lunches out. 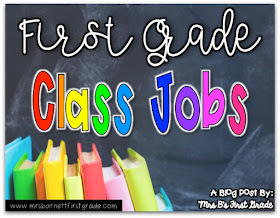 If I have enough students, I will assign two kids to this job. If not, I will let them pick a friend. Quiet Monitor - Has a clipboard with names on it. Walks in the hallways watching our line and looking for kids doing a great job. I never really follow up with the list that they make - they just like doing it! iPad Plugger - Plugs in our iPads. Afternoon Folders - Passes out our folders at the end of the day. On Vacation - Currently doesn't have a job! The best part of the change I made was that I put all the jobs on one piece of paper! My old chart took up so much room. This one doesn't. I can move the kids around with clothespins. I have also used magnets. There are a lot of possibilities! 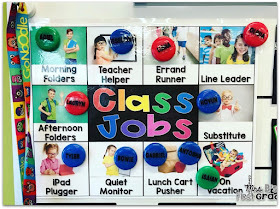 To purchase magnets similar to ones I used - click here! 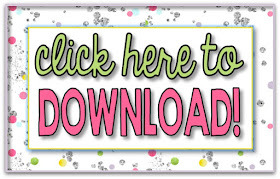 Just click below to download it for yourself. I've also included and editable version for you to make your own! 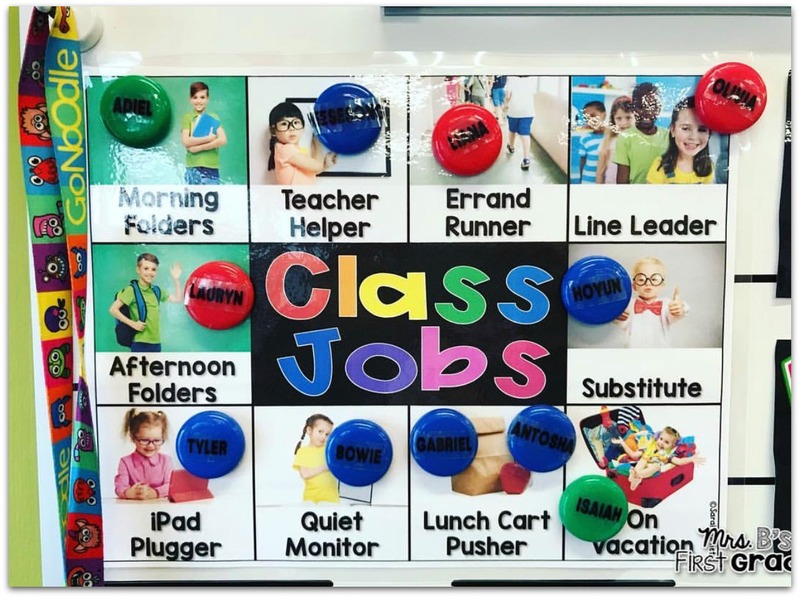 How do you assign and display jobs in your room? I would love to hear!